Catherine DeVrye is one of the most sought after speakers in Australia today. Best-selling author, columnist and frequent broadcaster, she has shared the platform with the Prime Ministers of 3 countries and President of the Business Council of Australia. 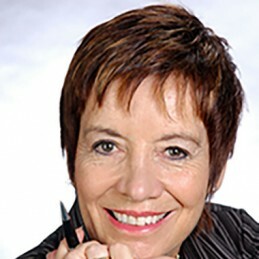 A CSP (Certified Speaking Professional, she was awarded Australian Speaker of the Year in 2010. Catherine’s memoir, ‘Who Says I Can’t?’ was nominated for the National Biography Award. Bryce Courtenay called it a ‘story of hope and perseverance’, asking ‘when’s the movie?’ Other best-sellers, translated into over a dozen languages, include ‘Hot Lemon and Honey – Reflections For Success in Times of Change (endorsed by Sir Edmund Hillary)’, ‘Hope Happens!’, ‘Words of Encouragement for Tough Times’, ‘The Customer Service Zoo’ and ‘Good Service is Good Business’, a #1 best-seller in Australia and Taiwan. Her most recent, endorsed by Dr Edward DeBono, is ‘Paperclips Don’t Grow on Trees – Add value not cost to your bottom line’. Catherine served as a speech writer/press secretary to Ministers of Consumer Affairs and Education. Prior to that, she was responsible for all sports funding; involved in the establishment of the award-winning “Life Be In It” fitness campaign; and author of a book on sports marketing. She was an independent board member of the 3rd largest police service in the world, an IBM executive in Asia, in Who’s Who of Australian Women, a former board member of the third largest police service in the world and past CEO of Young/Junior Achievement Australia. Catherine speaks internationally on customer service, managing change & turning obstacles to opportunities to follow your dream. Clients include American Express, AT & T, Bankwest, Coca-Cola, Domino’s Pizza, KPMG, Hewlett Packard, IBM 3M, Mercedes, Neways, Qantas, Red Cross, Remax, Royal Australian Airforce, TAFE, and the World Triathlon Championships. Catherine has written corporate histories and can write your story.